Last November, the discovery of a large hollow chamber or “void” within Egypt’s Great Pyramid caused a stir in the archaeological world. The discovery was the result of the work of the ScanPyramids project, and their two-year government-assisted collaboration with Egypt’s Heritage Innovation Preservation project, based out of Cairo University. Once the news about a hollow chamber was disclosed to the press, the discovery was decried in short order by Egypt’s Ministry of Antiquity, with Professor Zahi Hawass leading the charge. Arguments against the importance of the discovery have not quelled speculation about what the hollow area or chamber within the pyramid might be. Theories range from it being intended to lessen the strain placed on the massive structure by its stone components, to a possible gallery or chamber similar to others already known to exist within the pyramid. 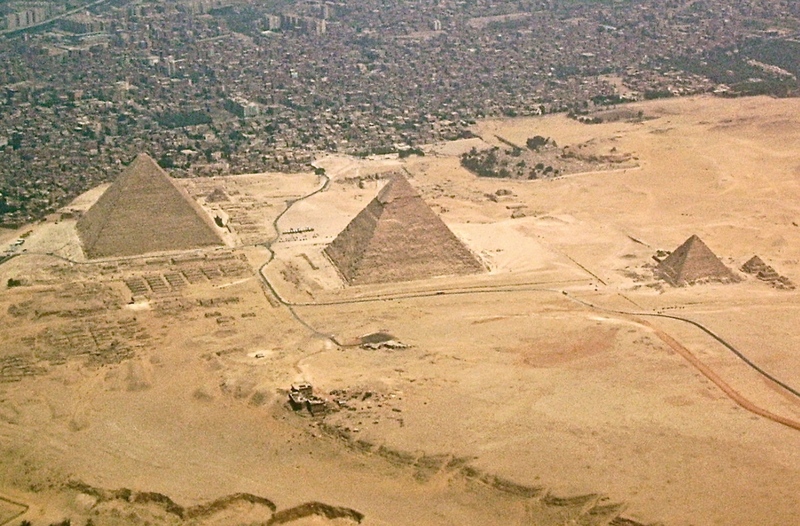 The Giza plateau, seen from above (public domain, Wikimedia Commons). 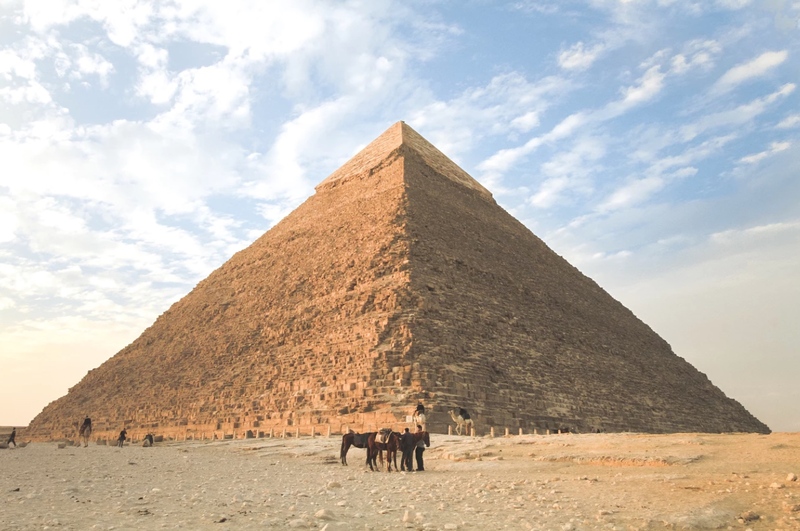 Favoring the latter position, an Italian mathematician has now weighed in on the matter, claiming that the area identified by the ScanPyramids Project may hold an “iron throne,” referenced in the Pyramid Texts. In Magli’s view, the structural implications of there being a hollow area in this region of the pyramid, rather than indicating a practically-designed void, suggests a more esoteric purpose. It is a bold speculation. In Magli’s interpretation of the texts, therefore, it is suggested that a literal “throne of iron” exists, presumably within the new chamber which remains sealed. It is unclear whether there are as-yet undiscovered entrances to this area, or whether they could connect with existing regions of the pyramid that remain unexplored, such as a sealed-off area beyond a limestone blockade within the “north shaft”, which has long intrigued Egyptologists. Much like Magli, Zahi Hawass has been one of the many to speculate what the significance of these doors within the north and south shafts might be, and how they could relate to clues offered in the Pyramid Texts (one translation of which can be read online here). 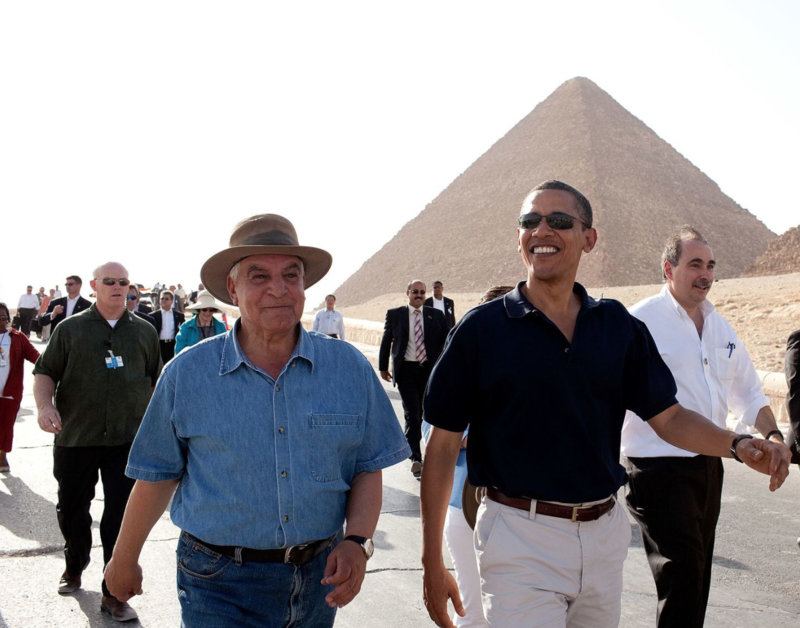 Zahi Hawass with Barack Obama in 2009 (public domain, WhiteHouse.gov). Rather than the alleged “iron throne” which Magli speculates may reside in the newly discovered chamber, it is at least more likely that the sealed-off area could somehow relate to Khufu’s own burial chamber; that is, if one of the existing chambers within the pyramid was not used for this, as some Egyptologists maintain. Of the claims that an additional “hidden” chamber exists beneath the so-called “queen’s room,” it was suggested in 2004 by two French amateur Egyptologists, Gilles Dormion and Jean-Yves Verd’hurt, that ground penetrating radar analysis of the pyramid revealed a previously undiscovered corridor, which might lead to a chamber “at the cross-section of the diagonals and the absolute heart of the pyramid.” The pair believed that this undiscovered area might be the actual burial chamber of Khufu, an idea similar to those expressed by Zahi Hawass. It remains to be seen what, if anything, might exist in the new area discovered by the ScanPyramids project last November, and whether this will shed new light on the many mysteries of Egypt’s Great Pyramid.